New England is world-famous for its spectacular autumn scenery, and for that reason many choose to visit this northeastern U.S. region during the fall. Often forgotten, however, is the summer season, particularly when venturing to the interior areas away from the coastline. This is where my wife and I headed recently to get a taste of inner New England’s distinct flair and style. Our first stop was Bretton Woods and the iconic Mount Washington Hotel and Resort in the White Mountains of New Hampshire. This sprawling hotel was built in the late 1800s by local tycoon Joseph Stickney, who brought in 250 Italian stone artisans to craft the building in Renaissance Revival style. 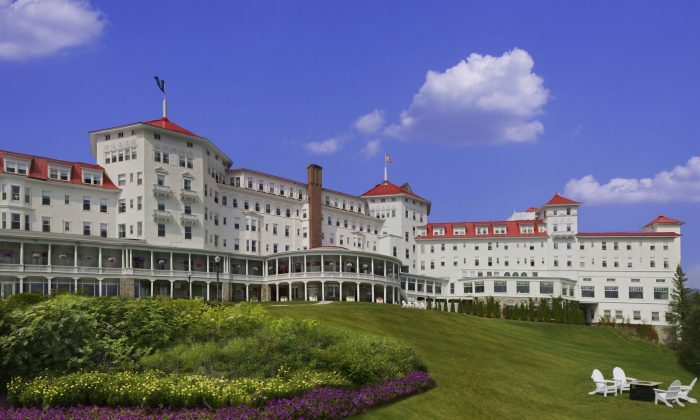 It was one of several grand hotels built in New Hampshire at a time when droves of wealthy New Yorkers took refuge in the White Mountains in the summer. The resort spans 2,000 acres within the 800,000-acre White Mountain National Forest, and boasts a Donald Ross-designed golf course, an alpine and Nordic ski centre, a spa, fine and casual dining facilities, and nine high-flying zip-lines. Upon entering the hotel lobby, which has retained the ambience of the early years, you can easily envision those who stayed here back then. The open-space areas encourage guests to wander about; be sure to take in the wrap-around open porch where you can enjoy the fresh air and marvel at the majesty of Mount Washington towering in the distance. Although a total of $90 million has been spent on much-needed renovations over the last 10 years, a number of the rooms still have that old-fashioned look of years ago, and the bathrooms can be a bit on the small side. The resort has plenty of activities, including organized excursions, but we found that one of the best ways to experience the area was to simply rent bikes and go in whatever direction took us. This is actually a great way to unwind and as we rode we felt the stress of city life dissipate. Those rich New Yorkers who fled the city for New Hampshire in the summer had it right—the White Mountains is a great place to escape to. The White Mountains is a great place to escape to. Of course, the main focus when visiting this area is Mount Washington itself. At nearly 6,300 feet above sea level, it’s the tallest peak in the Northeastern United States. Access to the peak can be had by train, car, and, for the more hearty souls, on foot via hiking. The peak is notorious for fickle weather, however, so stay aware of changing conditions. After a few days in New Hampshire we headed for neighbouring Vermont and the Brattleboro area. Our desire was to counterbalance what Mount Washington so ably provided with a location more low-key and intimate. Nothing fits that description better than the Four Columns Inn and Restaurant in Newfane, a small community just minutes north of Brattleboro. The Four Columns consists of just 16 spacious, upscale rooms, a farm-to-table restaurant, a tavern, a wellness centre and spa, and private hiking trails, all set within 138 acres. After it opened in 1965 as a guesthouse and dining destination, the Four Columns became the first authentic farm-to-table restaurant in the U.S.; the pond was stocked with trout, veggies and herbs were grown in the garden, chickens and pigs were raised onsite, and game birds were sourced from local hunters. The inn became something of a national destination, attracting the likes of Mick Jagger, Michael Douglas, and Sting, as well as economist John Kenneth Galbraith and political scientist Henry Kissinger. After being sold in 1981 it changed hands several times and eventually closed. It reopened in 2014 under new owners who have reinstated the farm-to-table approach and endeavoured to support sustainable practices while forming a link with the local community. We were delighted with the tavern, where locals are welcome as well as guests, and friendly conversation flowed easily. The peaceful atmosphere was also a joy—after our drive from New Hampshire I took an invigorating swim in the outdoor pool and the only sound was the chirping of birds in the nearby trees. As for the food, the Four Columns takes it to a level only the elite of elites can provide. Executive chef Frederic Kieffer and head chef David Smith go the extra mile in making sure the presentation and quality of the various food offerings is nothing less than what you can find in top tier big-city restaurants. We rounded out our trip with a stroll around Newfane, a charming town settled back in 1766 by hardy folks from Massachusetts. The town became prosperous in the 19th century, which led to the construction of buildings of various architectural styles such as Greek Revival, Federal, and Victorian. Today, these buildings have made Newfane a favourite tourist destination.